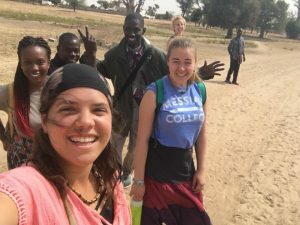 Hello from Senegal! Our team has already spent half of our outreach. The sun is shining, the people are warm, and we are learning! 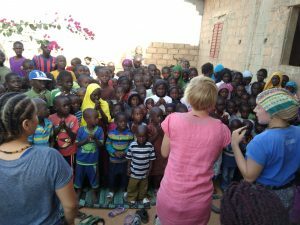 After we flew into Dakar, we spent time at the YWAM base in Gorom, and after that at a ministry house of women and girls, and are currently at the YWAM base at Niakhar. Our ministry times have consisted of mini day camps for kids, house visits to pray and share the gospel, leading church services, and doing support work for the bases like watering the gardens, cleaning the buildings. It’s been a wonderful and healthy time so far. The best day we’ve had so far was a camp with over 300 kids. We presented stories of the Bible, songs about Jesus and had 3 legged races. It was absolutely crazy! We’ve been learning a lot about kids in this culture. What type of discipline they need, what games work well, what stories are clear for them. It’s been amazing to share christ, laughter and love with each little one. Our favorite joke right now on the team is the war for the candy. One day we passed out candy on the last day of the camp. And the children went wild. It was an eruption of shouting, pushing, laughing and in general fighting to get the candy. At first we were stunned at the sheer energy for getting the candy but eventually we worked together with their mothers to ensure each child received a treat. It was the war for candy! 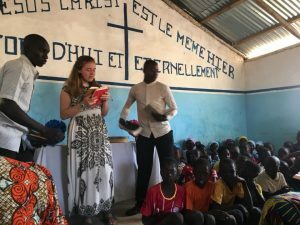 Our ministry times with the kids have ranged from teaching in the classroom, hanging out and drawing with the girls at the ministry house, hosting after school camps where we dance, sing, perform dances and skits, and play games. We’ve also held circus workshops, dance classes, and a henna party. It’s been thrilling to share in the joy of the kids and share the love and gospel with them each day.